The customer service contact center thrives on performance metrics. These metrics provide operational insight into the efficiency of the customer service process, including how effectively customer service representatives are performing their duties — as well as how well customers are being served. Many performance metrics are as old as the contact center industry itself and are still in widespread use today. 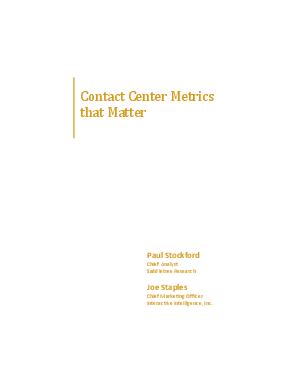 The purpose of this paper is not to disparage existing contact center performance metrics or to suggest that these metrics no longer matter. The authors acknowledge that the metrics that matter to the reader’s contact center are the ones that make sense in that particular situation. Rather, this paper explores some of the emerging metrics that specifically acknowledge and address the changing attitudes, objectives and definition of the contemporary contact center.